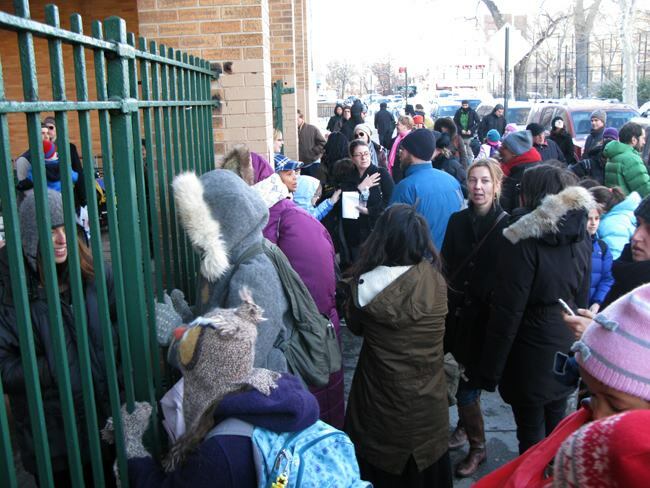 The South Brooklyn kindergarten crunch is on, and parents are freaking out. Registration began this week, and parents of rising kindergartners in the beloved and bulging school zones of PS 29 and PS 58, in particular, but also PS 261 and PS 38, are concerned that, with ever more kids and apartment buildings in Carroll Gardens, Cobble Hill and Boerum Hill, and ever more large families staying in the city, that there just aren’t enough seats for everyone. Twenty years ago, kids were bused in to fill empty seats at these schools. No longer. This was the first year that PS 29 filled its preschool seats entirely with younger siblings of kids at the school. A preschool coordinator in August told me the school was shocked at the number of siblings; that never in the history of PS 29 had the number of preschool siblings gone above 20 of the total of 54 seats. This year, there were 58 siblings applying for 54 seats. (In the end, several sibling did not attend, and I know of at least one non-sibling zoned kid that got into the preschool). Today, worries abound regarding recent news stories of too many zoned kids in some Manhattan schools, with kids getting bused elsewhere, after parents bought multi-million dollar apartments in the zone. And what of younger siblings? For as long as anyone can remember, kids with older siblings at Cobble Hill’s PS 29 and Carroll Gardens’ PS 58, no matter where they lived, were guaranteed a seat. Now, that guarantee is in question. This week, PS 29 sent letters home saying siblings entering kindergarten this year, who live out of the zone, should put their name on a waiting list. Officials at PS 58 said they might start a similar list. Word is out that 29 will check up on residency, as they have in the past, with home visits if necessary. In preschool, siblings get top priority, no matter where they live. If a 3-year-old from Bay Ridge has an older sibling at The Carroll School, that 3-year-old gets priority over a child living in the zone. When it comes to kindergarten, the opposite is true. First priority in kindergarten goes to zoned kids with an older sibling at the school. Second priority goes to zoned kids. Third priority goes to younger siblings of kids at the school, who live out of the zone. Once all zoned kids are placed, remaining seats go to siblings (whether they live in or out of the zone). At PS 29 this year, after all zoned kids were placed, and all siblings (whether residing in or out of zone), four seats remained for un-zoned kids, said the school principal, Melanie Woods. At 58, once zoned kids and siblings were placed, there was a little “wiggle” room left over, in case kids moved into the zone, but there were not any non-zone, non-siblings placed at the school, said parent coordinator Joan Bredthauer. At PS 58, the situation for kindergarten is tighter than at 29. Both schools seat 24 to 25 kindergartners per class of one teacher. The max allowed by the teachers union is 28. PS 29 has five kindergarten classes; Woods said the school will add a sixth if needed. That makes for 125 to 150 kindergarten seats at PS 29. At PS 58, there are six kindergarten classes, including two French immersion classrooms, made up of half fluent French kids, and half English speakers. A third class is a collaborative team teaching class, with 40 percent of the seats for kids with special needs. I myself became panicked when I saw the news Monday on Bococa Parents, my lifeline, that registration had begun at 29. The notice asked parents to report to the PS 29 administrative office between 9 a.m. and 11 a.m. with proof of address — unpaid, current utility bills, original leases or mortgage documents, letters from the IRS – in order to get an appointment to further prove residency. I talked with a couple of moms standing near the snow on Hoyt Street, Tuesday morning. “You better get on the list right away!” said one. “Nobody got in to preschool unless they had an older sibling at the school. There’s no hope for first born kids around here!” said another. So, I frantically rushed home, threw my paperwork together, and high-tailed it over to 29. Once I got there, it was almost a let down. Everything was so calm, cool, quiet. I was expecting a line of sweaty parents looking at each other with suspicion, as happened in September with the crush to grab remaining preschool seats. Back then I actually saw a dad toting his little girl around with a letter showing her picture and naming her attributes, as he smiled and cajoled. I thought he might ask the cute tot to do a jig. He told me he was zoned for 261, didn’t get in anywhere, and didn’t know what to do if he didn’t get into a preschool program, as they couldn’t afford private preschool, and both parents worked. As I headed back to PS 29 this week for the first round of kindergarten registration, I thought I’d see more desperate parents. I did not. Entering the PS 29 administrative office, I was the only parent. There sat the administrative guru, Maureen, who was calm and more than polite. She gave me the paperwork, checked my documents, and asked when it would be convenient for me to bring my child in February to register. When finished I grabbed the principal, Melanie Woods, as she was running to a meeting. She had one message for parents who live in the zone, and for parents of siblings at the school who live out of the zone: Calm your fears. PS 29 has never turned away a zoned child, nor a child who lives outside the zone with a sibling at the school, Woods said. And they don’t plan to. Later I called Parent Coordinator Joan Bredthauer at PS 58, and she told me the same thing. Neither PS 58 nor PS 29 has ever turned away a zoned child or a sibling, according to the schools. The wait list at 29 is for record keeping, Woods said. The school must seat zoned kids first, as per Department of Education rules, and then siblings who live out of the zone. “There is a pecking order that we must follow,” Woods said. “We’re marking they are siblings. But I’ve never, ever turned away un-zoned siblings. I don’t think people should worry about that. Bredthauer was less adamant about making room for un-zoned siblings. “It could happen,” Bredthauer said, that there wouldn’t be enough seats. “We never know how many little people will show up on the first day of school. It would be unfortunate, crazy and tricky if the school was flooded with more zoned kids than seats available, she said. The real concern is for rising kindergartners with older siblings at the school who live out of the zone. As far as the real growth in kids here, it’s tough to determine. Census figures only go up to 2008. And Bredthauer pointed out that the numbers given out by the Department of Ed about how many preschoolers apply for spots at each elementary school is misleading, because the numbers do not indicate where the kids live. The hundreds of kids that DOE says apply for each preschool seat at 58 and 29, and other popular local schools, could represent kids in Jamaica, Queens, and give no indication of the growth of zoned kids, she said. The issue is heating up in TriBeCa and lower Manhattan, where projections have estimated a shortage of 1,000 seats in the local schools by 2015, due to a baby boom in recent years. New NYC DOE Chancellor Cathie Black is getting heat for joking in a meeting about crowding at lower Manhattan schools that parents should practice birth control. So many of us moved here because, well, it’s awesome, and the public schools are great. We eat an extra rental bill, in apartments that are often not ideal, so our kids can go to a great, free public school. And somehow, word got out, and people move here from all over the world for the very same reasons. It used to be rare to hear of families with more than two children sticking around. Now it’s commonplace. When my daughter was in nursery school, when she was 2 and 3, in 2008 and 2009, she was one of two in her class from a single-child family (and now, even that mom is pregnant! Go Quennie!) All the other kids had one, two, even four (!) siblings. It’s great. Our city kids will be friends with big families and little families. But as the city continues to push construction of new apartment buildings featuring two and three bedrooms, and doesn’t build schools to accommodate the kids, it’s uncertain what the future will hold for schools like 29 and 58. The uncertainty is rough, and costly. The pre-K registration system this year was outrageously stressful for those of us who had to endure it. Getting notified the day before school starts whether you get in, and where, and having private school deposits out there as a backup, was fun for nobody. “Why do they make it sooooo painful,” said my friend, Ann Akiri, who has lived next to her zoned preschool for 7 years, and did not get in. For Ann, and for myself, the preschool drama worked out great in the end. My daughter was offered a seat at PS 32 four days before school started. We could not be more happy with the program, school or teachers. Ann’s son went to PS 133, in the Gowanus/Park Slope area, where this fall he will start in the new French immersion program, launched by French parents who realized how competitive the French program at PS 58 had become, especially for those who do not live in the zone. Rachel Lozano lives in PS 29 and has two young sons. Her husband was in Uganda with Doctors Without Borders when she was applying for preschool this summer. She got in nowhere. After the second round, Rachel, a native of France, missed work as a nutritionist at UNICEF to walk around to the schools, begging for a spot, to no avail. So, her preschooler remained this year in day care, as the family could not afford private preschool. Now, Rachel is worried, and does not trust that she’ll get in to 29, even though she is zoned. She said the office at PS 32 asked her not to call back, or to return, as she did not live in zone. As I talked with her on her cell phone on Friday, she said she was walking quickly to PS 29, to register her son for kindergarten, and to ask questions. Related Story: New French immersion program opens at PS 133 in Gowanus/Park Slope, and heading to Boerum Hill. Register this week at PS 29 to get appointments in February for formal kindergarten registration. Put your out of zone sibling on the wait list. At PS 58, register by March 4. Once registered for kindergarten, you can register for the French immersion program. English-speakers can register on April 15. The lottery to determine who will get in to the French program, as an English speaker, is May 9. Just to clarify regarding applying for Kindergarten at PS 58: Families of zoned children born in 2006 should come in during the application period (now until Mar 4) between 9 and 11 AM any school day. Bring 2 proofs of address and the child’s birth certificate or passport. (No need to bring the child, yet.) By March 25, you should receive an appointment to pre-register your child between March 28 and April 15. For information on key dates and eligibility for applying to the French Dual Language program, please visit our website, http://www.ps58.org. Great article – thanks for all the information! Thank you so much for such a great article! My daughter is only 2-1/2 at this very moment so I don’t need to jump in the fray just yet. But, I have friends with children in both PS58 and PS29 and have shared countless stress sessions with them during registration season and again at the beginning of each school year. Each and every time it ignites my own stress/frustration on the topic (especially since I’m from the midwest where you just go to your local school – end of story). I have lived in the Bococa area for nearly 10 years and have watched the ongoing apartment development. My growing concern has always been the lack of education development to support the growing population. Especially since a generous portion of population is children. I’m sure there is some bureaucratic method involved in determining when/where/how to add a new school in NYC but the areas mentioned in your article appear to be some excellent choices.